Browsing 34 posts in for fun. I wish I could tell you that we weren’t going to ruin your makeup when you come in to see us. It would thrill me to explain to you the gorgeous new filling we’re placing can be done without messing your hair up or getting your shirt wet. But I can’t. In good conscience, I need to tell you that we’ll probably make a mess out of you. When you use the handpiece on a tooth to remove diseased or broken tooth structure, it generates heat. According to research, this heat isn’t great for the pulp (nerve, blood vessels, connective tissue) in the middle of the tooth. Teeth that get overheated can become injured and may need a root canal. However, when you spray water on the tooth while you work on it, you significantly reduce the heating up of the tooth structure. Water spray from the handpiece also removes debris. When I use the handpiece to remove diseased tooth structure, it breaks this stuff into really tiny pieces. 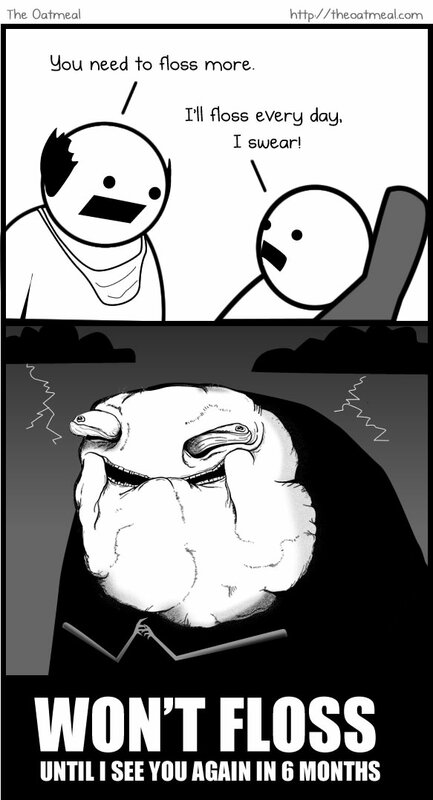 It actually kind of pulverizes it into a dusty powder. Without the water spray this stuff smells pretty gross and keeps me from seeing what I’m doing. If you add the water spray, this debris gets gently sucked up into my assistant’s suction. So please understand, I’m not using the water spray to mess up your makeup on purpose. In fact, you may want to skip your hair and makeup until after your dental appointment. We have a lovely bathroom with flattering lighting that you can use to put yourself together, if you like. 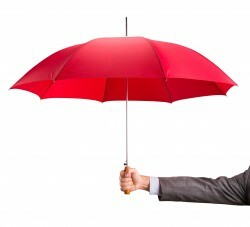 Also, I won’t be offended if you bring an umbrella or shower cap in. I get it. Did you find this post all wet? Entertaining? I’d love to hear about it! You can share any Mead Family Dental post with a “Like” on Facebook, a “+1″ on Google+ or you can even “Tweet” it with Twitter! All you need to do is hover over the heart shaped button next to the title of the post. Or you can leave a comment by clicking on the balloon shaped icon next to the title. 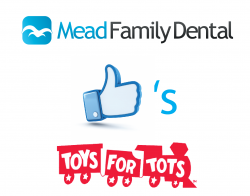 Mead Family Dental “likes” Toys for Tots! The holiday season is here! And with it comes giving. Here at Mead Family Dental, we’re going to be giving to Toys for Tots in Saginaw…and you can help! 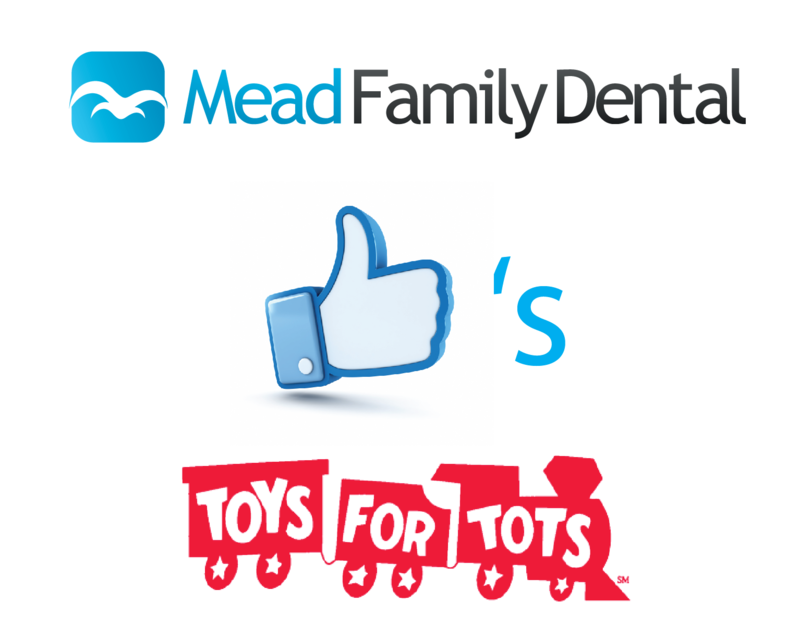 For each new “like” we receive on our Mead Family Dental Facebook page, we’ll donate $2 to Toys for Tots! So how can you help? Click here to go to our Facebook page. 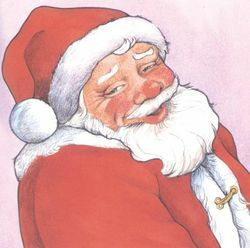 All you have to do is click the “Like” button on our page and we’ll donate $2 to Toys for Tots! Hooray! As I write this post, we have 284 likes. So for each like over 284 from today (Monday, November 19th, 2012) until Christmas (Tuesday, December 25th 2012) we’ll donate to Toys for Tots*. While you’re there, you should check us out. We post fun and interesting stuff up there all the time. If you’re one of our satisfied customers and you want to tell the world, you could leave us a review right there on our Facebook page! By liking a Facebook page, you’re inviting us to show up on your Facebook wall occasionally. I take that permission seriously and I promise not to junk your wall up with lame stuff…seriously! Now some of you may be thinking, “Well, Dr. Mead. I want to get in on the holiday cheer but I’ve already liked your Facebook page…what about me?” I’m not going to leave you out in the cold either! You can share this post or our Facebook page with friends so they can “like” us, too! See, everyone wins! 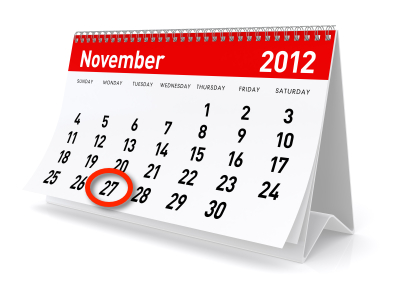 Help spread our some holiday cheer and get great dental information as well! Go “like” us today and help Toys for Tots in Saginaw! 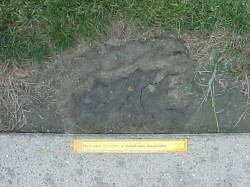 Sasquatch sitings in central Michigan are rare. Particularly in the Saginaw Valley. Saginaw hasn’t had any reported sitings of the ape-like cryptid since 1937. However, that’s not to say they aren’t around. As recently as 1977 they’ve been reported in the thumb, so I never doubted that they were around. I’ve always taken a special interest in sasquatches due to their love of sweets. 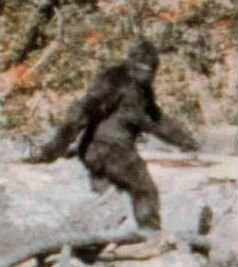 Anyone with even a passing interest in cryptozoology knows that a bigfoot won’t pass up a chance to gorge on honey or other sugary treats. So it’s no wonder they suffer from toothaches. The team here at Mead Family Dental have let it be known that we’re happy to see any creatures suffering with toothaches, and apparently word gets around. 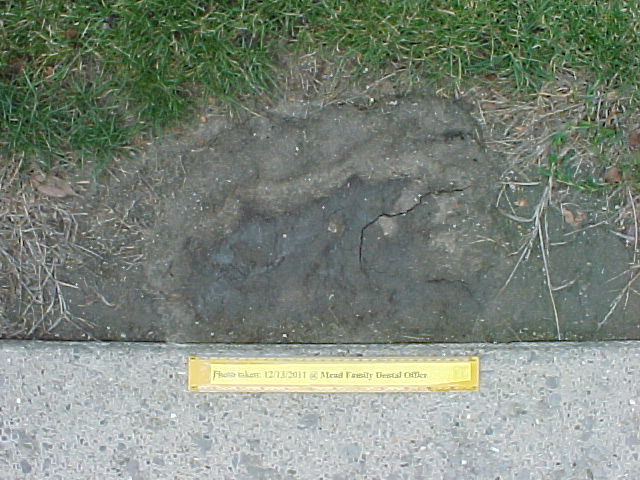 On December 13, 2011 we found what we’re pretty sure is a sasquatch print. We figure that the poor ‘squatch had a toothache and caught us on a Thursday afternoon after we’d left for the week. Since most sasquatches don’t have smartphones (poor reception in the wooded and mountainous areas they inhabit) he wasn’t able to call the emergency number at (989) 488-7665. I feel bad about that. I hope this poor bigfoot knows that we’re happy to see him and take care of any of his dental needs if he’ll just drop us a line. Maybe he’d prefer to make an appointment online. I’m not sure. We went ahead an made a cast of his footprint. We’ve got plenty of dental stone and we wanted to let people know about sasquatches and their dental problems. So, we’ll have the cast of this poor suffering bigfoot available to look at all April long. Drop by to take a look. I think you’ll be impressed. Unfortunately, we haven’t heard from him yeti. We all know that Michigan has been in an economic slump. What if you could do something simple to help a small business in Michigan? Well, you can! An inventor and small business owner by the name of Rob Malen has asked me to get the word out about his ingenious children’s toothbrushing trainer. He’s called it Brushyball! Rob and his company are competing in a contest by Walmart called “Get on the Shelf.” By voting for him you improve his chances of being chosen to be a product on Walmart’s shelves! Go to http://www.getontheshelf.com/product/3559 and vote by text message or using Facebook. According to Rob you can vote once per day until April 3rd. Support good brushing habits for kids and support Michigan business! Vote for Brushyball! ‘Twas the week before Christmas with plans winding down. Not a dentist was working, it seemed, in our town. when Johnny first noticed a new canker sore. It was sore under his tongue and it hurt when he talked. A glass of cold orange juice made him sit up and squawk! After screaming and dropping his glass, which then shattered. The timing was awful with Christmas Eve the next day. How would he manage? Christmas was looking quite gray. She picked up the phone since she knew who to call. And she dialed Dr. Mead with no worries at all. 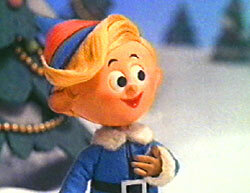 I submit that Hermey the elf embodies all that is good about humanity. Hermey followed his dream at great sacrifice to himself. They probably didn’t eat turkey on the first Thanksgiving (in 1621). Roasted goose and duck were most likely eaten. The average American eats 13.1 pounds of turkey each year. 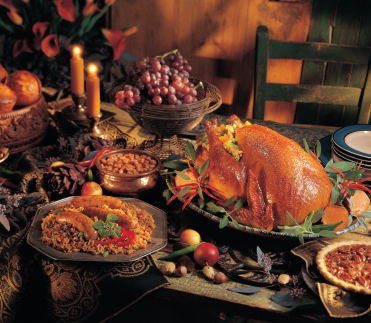 This year Americans will eat more than 45 million turkeys! Michigan raises more organic turkeys than any other state! national holiday. It was declared to be the fourth Thursday in November. Cranberries are also known as “bounce berries” because they bounce! I have not personally verified that…if I do I’ll let you know! Fossil evidence shows that turkeys were found in North America over 10 million years ago. Fifty percent of Americans put the stuffing inside the Turkey. Are you an “in the Turkey” person or “out of the Turkey” person? Personally…we do both! The average American consumes 4.5 pounds of sweet potatoes per year. So are you hungry yet? Thanksgiving is going to require an awful lot of chewing, and chewing requires that your teeth are working the way they’re supposed to. Are your teeth working like they should? Are you going to enjoy your Thanksgiving feast? 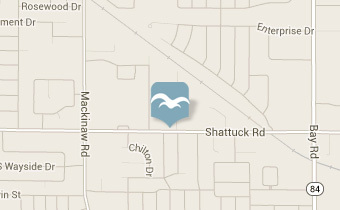 Are you looking for a Saginaw dentist? 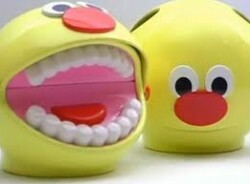 If you haven’t had your “chewing apparatus” (aka: teeth and gums!) checked in a while, drop me an email at alan@meadfamilydental.com or call the office at (989) 799-9133. We’ll get you in ASAP and make sure you’re all set for the holidays!